It’s official: today I’ve become a homeowner. After nearly a year since I’ve returned to Minnesota, I now have a single family house, minus the family. This spring and early summer, I toured 26 homes and researched several hundred more online to combine findings from real estate listings, similar recently sold homes, Google Maps’ streetviews and aerial views, school districts, city parks, county tax records, potential commutes, neighborhoods, and gut feeling. Another search criteria was a home that could fit a 7’6″ grand piano. Mind you, I don’t even own a grand piano…yet. 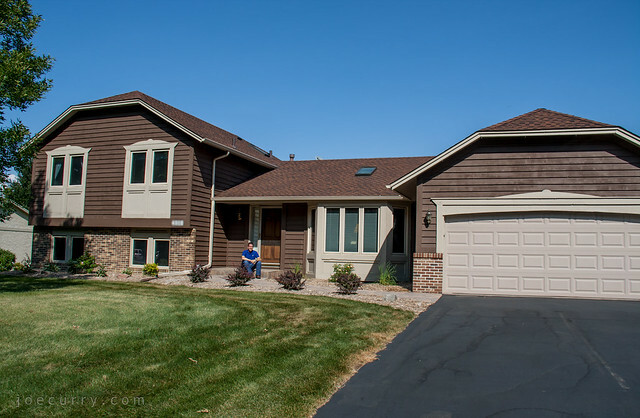 This 1986 Plymouth, Minnesota home has 4 bedrooms, 3 bathrooms and was sold by the original homeowners, who obviously took great pride in it. It’s immaculately clean, has a large backyard with a perfect patio, and the best part is that no improvements are really needed. There are a few enhancements on my list to contemporize the house such as light fixtures, drapes and window curtains and of course, new paint. The walls are currently in every color of the visible spectrum from beige and burnt red to daffodil yellow, bright orange to celery green, aqua green to gold and royal purple. So, you fill not find those photos here today! When I moved back to Minnesota last August, coincidentally or not, I’d picked the apartment floor plan “Plymouth.” Who could have known that ultimately I’d be living in Plymouth next!? Even with my downtown living this past year, most of my friends have preferred doing things in the suburbs or elsewhere in the city that required driving, so suburban living in the Twin Cities is not the same social pariah situation as Elmhurst, Illinois was to the city of Chicago. I will most definitely miss my amazing, four-block commute to work and being next door to adventures in Loring Park (here, here and here and poutine), though I’ll be closer to my church and some relatives, and I’m ready for my next adventure. My roots and childhood memories will always belong to a special hometown in South Dakota, but today, I feel at home in Minnesota.